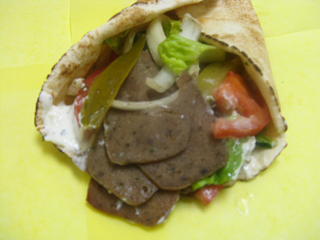 Grilled Sliced beef or lamb, lettuce,tomatoes, pickled cucumber, onion, tzatziki sauce and wrapped with pita bread. One skewer of fresh ground beef seasoned onion, lettuce, tomatoes, pickled cucumber and tzatziki sauce. Cooked on open fire and wrapped with pita bread. One skewer of fresh ground chicken seasoned with onion, lettuce, tomatoes, pickled cucumber, tzatziki sauce. Cooked on open fire and wrapped with pita bread. 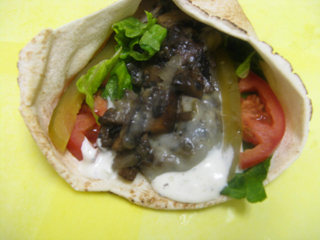 Grilled Mushroom and onion with cheese,OR falafel, lettuce, tomatoes, pickled cucumber, onion and tzatziki sauce, wrapped with pita bresd.